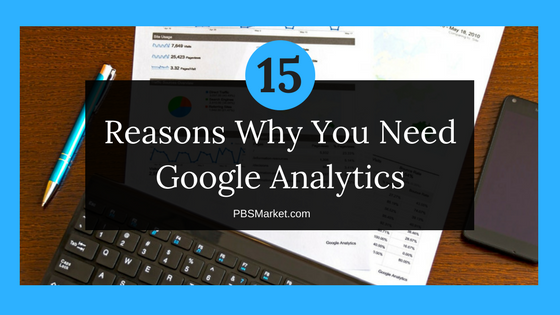 Have you wondered why you need Google Analytics? The number one goal for any website owner is to get as many people as possible to view their site. This is true whether you have a blog or a site where you are selling a product or service. Anyone that takes their time and provides valuable content wants it to be viewed. So how do you know if anyone is reading? Google Analytics is your window into who’s viewing your content. 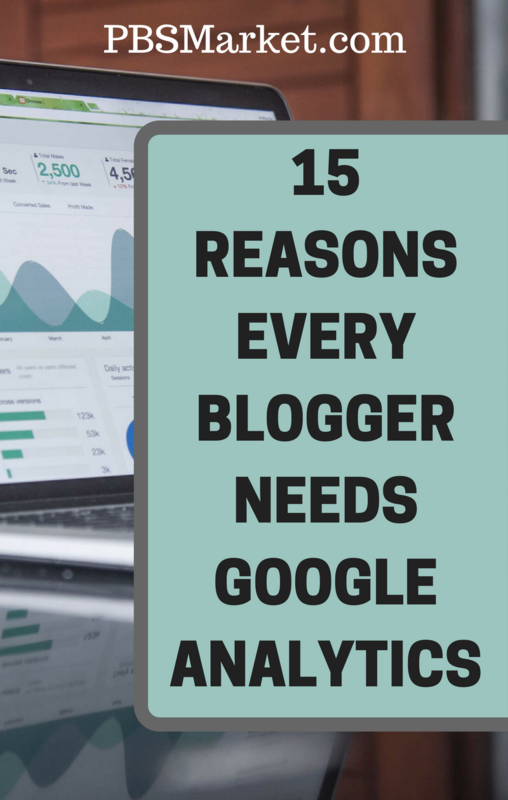 In this post, I’m going to tell you 15 reasons why you need google analytics. Google Analytics is a free web analytics service offered by Google. It allows you to see various metrics relating to your blog or website. Google Analytics tracks and reports on website traffic. Reason 1: You can’t improve if you don’t know your stats. The purpose of a marketing strategy is to improve views, leads, sales, or conversions in general on your site. In order to improve these metrics, you first have to know where you are now. For example, in order to know if you are getting more views of your blog post you have to know how many views you are getting now. You can then implement a marketing strategy and see if it results in you getting more views to that post. Why you need Google Analytics: Google Analytics will allow you to see where you stand with various metrics. It will also show you how you progress with these metrics over time. This will allow you to know if your marketing strategies are successful. Reason 2: You need to know how many visitors are coming to your site. Every blogger or website owner needs to know the number of visitors coming to their site. This is an especially important metric if you have monetized your blog. Visibility to your audience lets you know how your marketing campaigns are performing. Why you need Google Analytics: Google Analytics will tell you the number of visitors that come to your site. It can even show you a real-time view of those visitors. Reason 3: You need to know how many active visitors you have on your site. It is not enough to just know how many people visited your site, you need to know specifically how many users were active on your site at any given time. Why is this important? You must know the number of concurrent users that are expected to your site to ensure that your site can handle that amount of traffic. This is especially important when running heaving marketing campaigns. Knowing a number of active visitors on your site can help you determine if you have your site hosted on servers that can handle your traffic. Why you need Google Analytics: Google Analytics will tell you how many active users are on your site at any given time. It can also tell you the number of active users over different time periods. Reason 4: You need to know if you are getting new or returning visitors to your site. Having a count of people coming to your site is great. Knowing if those visitors are new or returning visitors is also a very valuable piece of information. Return visitors are those that have found your site and like your content. These are your loyal readers or customers. New visitors are those who have just discovered your site. You should constantly be generating content that pulls in new visitors and keeps your return visitors coming back for more. 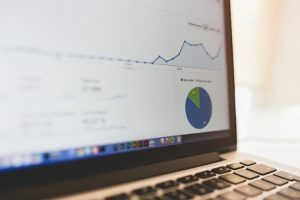 Why you need Google Analytics: Google Analytics breaks down your audience based on New Visitors versus Returning Visitors. It gives you a clear view of if your site is bringing in new visitors and bringing back return visitors. 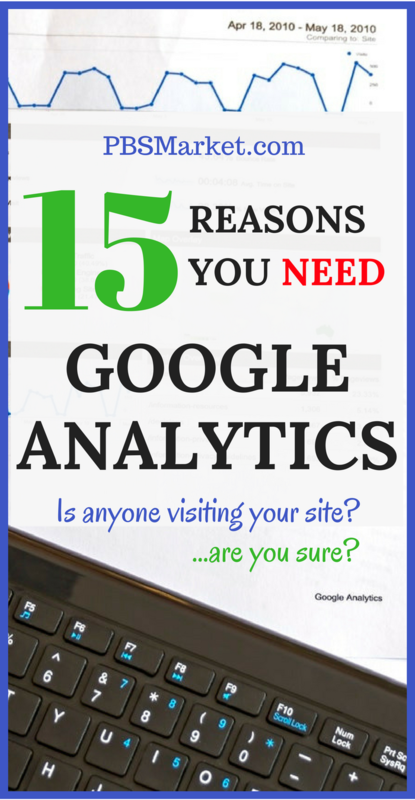 Reason 5: You need to know how your visitors found your site. You’ve got people coming to your site! But wait… how did they find you? Knowing how visitors found your site is key to increasing the number of visitors that find you. Are you getting traffic from social media, are you being found in search engines, or are you getting direct traffic from an offline campaign? This is information that you must know if you want to increase your traffic in any one area. Why you need Google Analytics: Google Analytics can tell you exactly how your visitors were referred to your site. It is so specific, it can tell you exactly what page on the internet your visitor was on that lead them to your site. For example, let’s say you want to know if you are getting any visits to your site as a result of your Facebook Fan page. Google Analytics can show you how many of your site visitors were referred from the link on your Facebook Fan Page. Reason 6: You need to know how long your visitors are staying on your site. Your goal as a content writer is to create engaging content that is informative and entertaining to your readers. Knowing how long your visitors stay on your site will give you clues on how engaged your readers are. Are your visitors reading the page after they arrive? Are your visitors staying to read the entire page? Is the content on the page what was expected by the visitor? These are all questions that can be answered by reviewing how long your visitors are staying on your site. Why you need Google Analytics: Google Analytics can tell you the average length of time your reader stay on any given page. Depending on the goal of the page, this information can give you clues to change that might be needed to your site to keep visitors on the page a longer or shorter amount of time. Reason 7: You need to know what people do once they get on your site. In many scenarios, a visitor will come to your site as a result of a single search engine query or from a specific ad or post on social media. Once the visitor is on your site, you would like them to look around for other content that they might find useful. Most blogs are equipped with features such as Related Posts, Categories, and Tags that are designed to guide the visitor to other interesting content on the site. In order to know if these features are working, you need to know what people do once they get on your site. Do they only read the initial page they were referred to? Or do that follow a specific path based on your internal links? Are they going where you planned or hoped they would go? Knowing what people do once they get on your site can help you refine and test your strategy for guiding your visitors around your site. Why you need Google Analytics: You guessed it! Google Analytics can tell you exactly where your visitors are going once they land on your website. It will give you a detailed analysis in for form of a diagram which shows you the pathways most following by your visitors. This information will allow you to make the needed changes on your site to guide your visitors exactly where you want them to go. Reason 8: You need to know the demographics of your visitors. When marketing any product you need to know your audience. This holds true when marketing your business website or blog site. Who is your target audience? It is important to know things like gender, geographical location, age, and the technologies that they use. Know this information will tell you if you are reaching your target audience. It can also give you insights on demographics that you might not have known were interested in your site. 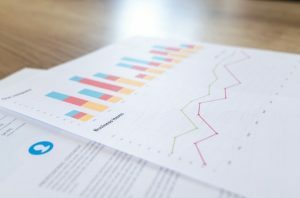 Why you need Google Analytics: Google Analytics can tell you tons of information relating to the demographics of your visitors. It can tell you gender, geographical location, age, and what device and browsers your visitors use to access your site. Reason 9: You need to know if you are being found in search engines. Organic traffic from search engines is a must have for any website or blog. Seach engines allow you to receive hundreds if not thousands of visitors to your site. You need to know if your content is being presented to search engine users when they search for related keywords. This is key to any online marketing strategy. You must first know if you are being found by search engines to determine a strategy for getting more traffic from search engines. Why you need Google Analytics: Google Analytics can tell you if you are getting traffic from search engines. It can tell you what search engines are referring visitors to your site a well as the keywords they are using to find your content. Reason 10: You need to know what keywords are being used to find your site. In order to be found in search engines, you must employ search engine optimization (SEO) techniques to your site. This includes both site level and page level SEO strategies. A major part of implementing SEO on your site is predicting what keywords your potential visitors will enter into search engines to find your content. You would then optimize pages of your site to ensure that when those keywords are entered into search engines, that your page comes up in the results. In order to know if your SEO strategies are successful, you must know what keywords are being used to find your site. 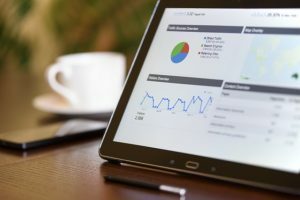 Why you need Google Analytics: When used in conjunction with Google Search Console, Google Analytics can give you detailed information relating to the keywords that are being used to find your site. You can learn the exact keyword phrases that will result in your site being presented to search engine users. You can also find the position of your page in the search engine results. This information is critical to implementing strategies to improve your search engine ranking. Reason 11: You need to know what content your readers like best. Are you delivering the content that your visitors what to read? It is easy to get lost in posting content that you find interesting, but you must also ensure that your readers find your content interesting as well. In order to determine this, you must know what content on your blog your readers like best. With this information, you can continue to provide this type of content to keep your readers coming back for more. Why you need Google Analytics: Google Analytics can tell you the content on your site that gets the most views. It will even tell you if those views are from new or returning visitors. This information can guide you in the right direction when determining what type of content to focus on to keep your visitors entertained and informed. Reason 12: You need to know if your Social Media strategies are working. Utilizing Social Media is a great way to advertise bring new visitors to your blog. Facebook, Instagram, Twitter, Snapchat, and Pinterest are some of the most well known social media platforms for sending traffic to your website or blog. Once you implement your social media strategies, you need to know if those strategies are bringing visitors to your site. You could be pulling tons of traffic from Pinterest, however, you might not be getting the expected amount of traffic from your Facebook Fan page. Why you need Google Analytics: Google Analytics can show you what traffic is coming to your site as a result of your social media campaigns. This will clearly show you which social media platforms are sending you the most traffic. Reason 13: You need to know how your promotions are performing. As a blogger or a website owner, you will use various promotions to bring traffic to your site. You will often have multiple promotions running at the same time. In order to know if your promotions are successful, you will need a way of knowing if your traffic and conversions are increasing. Monitoring if you are getting more sales is easy. But tracking which promotions are bringing in those sales can be a little tricky. 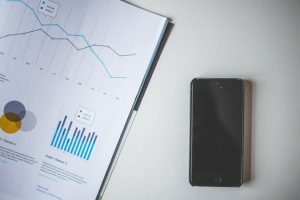 Why you need Google Analytics: Google Analytics can show you various types of information that will tell you how your promotions are performing. It can show you information on conversions, clicks, and referrals. Reason 14: You need to know if you are getting conversions. A conversion is when someone completes any desired action on your site. For example, if a visitor submits a form, makes a purchase, or joins your email list. Conversion goals vary depending on the type of site. If your visitor completes your call to action, then that is a conversion. If your goal is to get conversions, then you need a method of tracking if you are getting them. One of the conversions that I track is email list sign-ups. Please take a moment to subscribe to the PBS Market Blog. I’ve included a convenient form below. 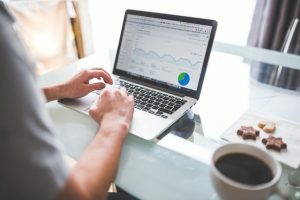 Why you need Google Analytics: Google Analytics has a customizable feature that allows you to track the goals that are important to you. It can help you view conversions in the areas of revenue, acquisition, inquiries, and engagement. Google Analytics provides a clear view into your visitors’ behaviors so that you can make the necessary adjustments to get the conversions that will make you successful. Reason 15: You need to know what devices your visitors are using to access your site. There are multiple ways people can access the internet and subsequently your site. These methods include desktop computers, laptops, smartphones, tablets, and even smart TVs! You might be wondering… why does it matter? It is very important to know what devices your visitors are using because you must ensure that your site is optimized for those devices. For example, what if your site is not designed for mobile browsers? You might not see this as a problem. However, what if 75% of your traffic comes from people that are accessing your site from their smartphone. When these visitors visit your site it is not presented in a mobile-friendly format which causes them to leave. Not Good! Why you need Google Analytics: Google Analytics can show you what devices your visitors are using to access your site. This information is key to ensuring that you are presenting content to your visitors in a format that is suitable to the way that they are accessing your site. Google Analytics can even tell you if your visitor is using an iPhone or an Andriod phone. Pretty cool huh! If you don’t currently have a website or blog and you are ready to dive in, take a look at the post How to Start a WordPress Blog. Great article. I need to use Google Analytics more often. I don’t remember the last time I checked my account. Thanks Stunning! I am so addicted to checking GA. I love seeing exactly what’s going on with my blogs.